Adding a resume to your profile will open the door to Brian’s “Special profileCastings” that he only sends out to those with both a headshot AND resume. If you are new to the business or if you have been around, but just have not created your resume yet, here are some things you can do. 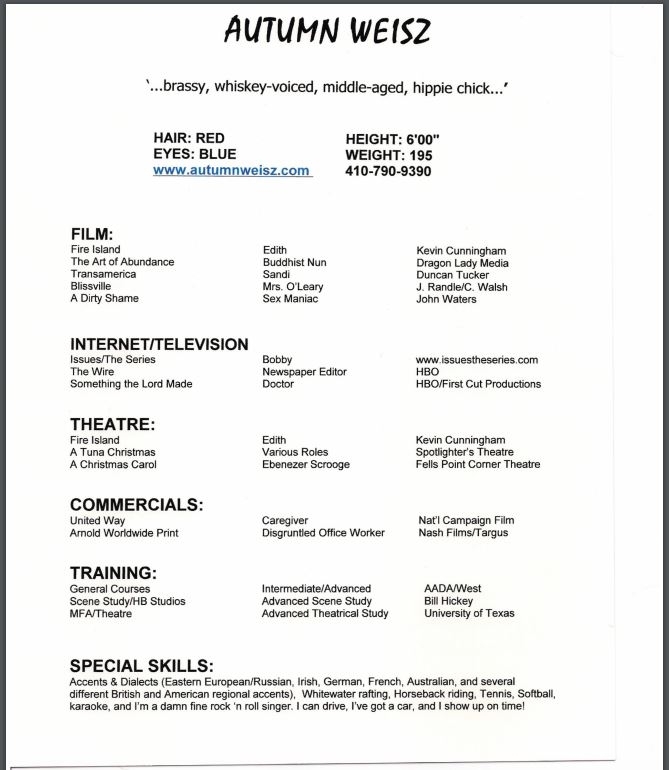 To start, if you have worked ANY acting jobs at all, even a play in grade school or high school, I would suggest filling those job(s) into our “Fill out a resume” app found in the “Manage profile” link on the main menu. Filling in just one job will open the door to Brian’s “Special profile Castings” that he only sends out to those with a headshot AND resume. Click this: A resume that works - so you will too. Some good info here for those just starting. Then look at some well-done resumes from our upgraded members. Below are some links. When you get to their profile, Click on the “Resume/Files” tab on their profile and open their resume. Now although some are a bit different in fonts and how the top looks, the main job setup is the same…3 columns. The first column is the name of the project. The 2ndcolumn is the character that you played. And the 3rd column is the production company. At the top should be name, contact info and some specs (hair color, eye color, height, weight and age range). At the bottom should be your special skills that a casting company may need…like you ride a Harley, or you are a gymnast, or firearms specialist, languages spoken, dialects, etc. And finally the classes that you have taken. So Click the links below, take a look and let us know if you need more help. .
1) Fill out your resume: On the DragonukConnects main menu, click the menu link, “Manage Profile”. On the next page, choose, “Click Here to fill out or edit a resume”. Follow the instructions on the next page. 2) Upload your resume document: On the DragonukConnects main menu, click the menu link, “Manage Profile”. On the next page, choose, “Click Here to upload, edit or delete a resume”. Follow the directions on the next page. We only accept PDF’s or Word Docs (Allowed formats: .pdf, .doc, .docx, .rtf). 3) Send us your resume document: We will be happy to upload your resume for you. Just send us an email and attach your PDF or Word Doc (Allowed formats: .pdf, .doc, .docx, .rtf).